Wednesday morning I woke up, hugged Lenei goodbye as she went off to work, caught up on my internets, then packed up and headed out the door. First destination? Royal Palm Cemetery in West Palm Beach, where a relative was supposedly buried according to the Veteran’s Administration National Gravesite Locator. However, according to the cemetery office, he was not. Strike #1. Then, a block away from the cemetery, I was waiting to turn right when my car got rear-ended. Fellow behind me was watching the light and not me. I was watching the crossing cars. In Florida there often seems to be one car at every light that blazes through the red just after it turns. I did not want that car to hit me. The car behind me did. Minor damage to my car. I’ll have it looked at when I get home and if a shop determines it’s a safety hazard, then I’ll get the guy or his insurance to pay to replace it. 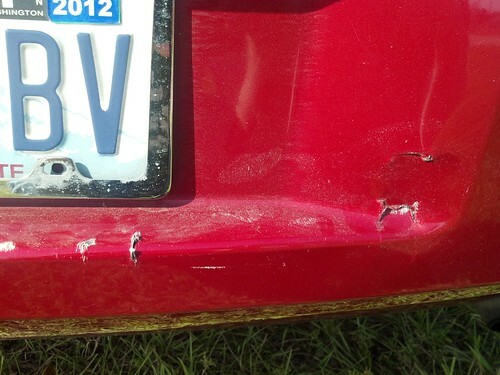 I’ve got other dings on the bumper, so I’m not going to fix it if there’s no safety issue. 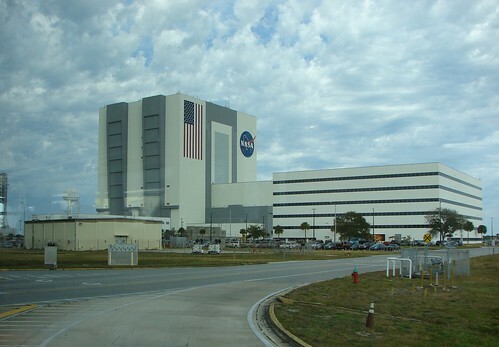 Planned stop was the Kennedy Space Center. But on the way, I followed a fire truck in I-95 for about 20 miles. It was running with its lights, but under the speed limit. I wondered what was up, but after a few miles I noticed a giant smoke cloud in the distance. There was a 20 acre brush fire in one of the towns near the K.S.C. Police had all roads nearby closed, so I couldn’t use them as a shortcut to K.S.C. The smoke cloud was immense though. 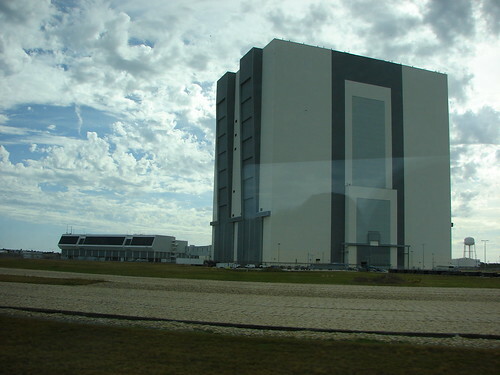 I arrive at Kennedy Space Center around 1:30. The approach is via a long straight causeway from the mainland. The parking lot wasn’t very full, but I still arrived after the last up close tour had sold out. So I had to settle for general admission, which includes a tour to an observation gantry and to an on-site exhibit covering the Apollo program. The bus drives past the assembly, but doesn’t stop. Still, it’s closer than we got to anything else that wasn’t an exhibit. 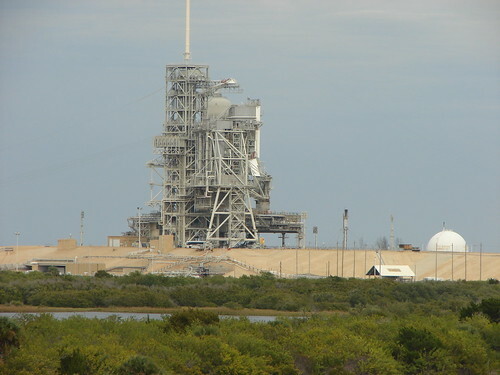 LC 39 Observation Gantry was pretty meh. Basically you can see the assembly building and a bunch of launch towers in the distance. Heading back to the bus to go to the Apollo exhibit, I ran across a cup laying at the bottom of the tower. 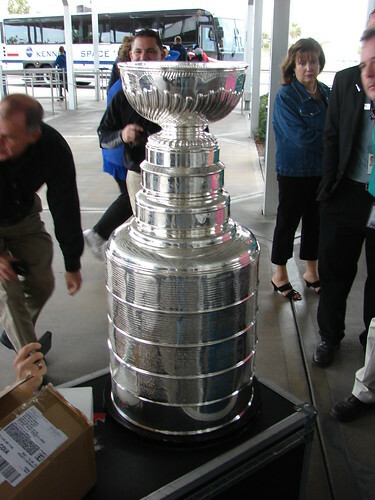 Why the Stanley Cup was being shown at the Kennedy Space Center I don’t know. Cool for hockey buffs I suppose, but it seems kind of a non-sequiter at the space center. The Hockey Hall of Fame in Toronto makes more sense. I checked out the event page for the Stanley Cup at the Kennedy Space Center. The C.E.O. of the company that runs the K.S.C. visitor complex is the owner of the Boston Bruins, the 2011 winner of the Stanley Cup. They were also letting some folks try on an actual N.H.L. Championship ring and get photos with it. One guy was really really chuffed about that! The Apollo/Saturn V Center was really awesome. 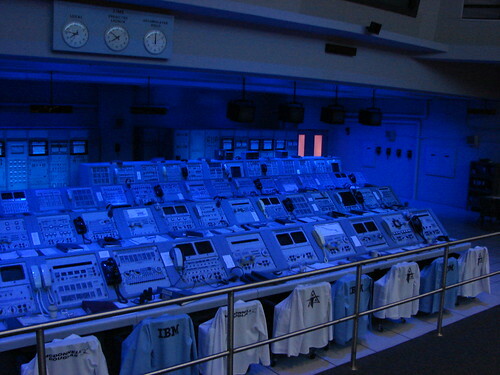 There they have what they claim is the actual equipment from the Apollo 8 launch set up in a theater. The exhibit plays the audio from the final 3 minutes of the Apollo 8 countdown with spotlights on the seats where the person speaking each part would have sat. Also, the auditorium rumbles with what I assume is the same amount of motion that accompanied the Apollo launch. 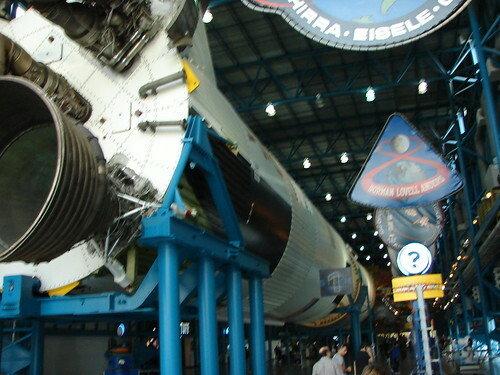 In the main part of the center is a full size Saturn V rocket suspended from the ceiling. It is immense. It took me about 3 minutes to walk the entire length of the rocket. The center also had a treasures exhibit with a number of items including prototype and actual moon space suits and other tools. There are some moon rocks there, including one visitors can touch, though it felt to me like it was encased in a thin film of plastic. Pretty cool. After the center, I returned to the main visitor center. 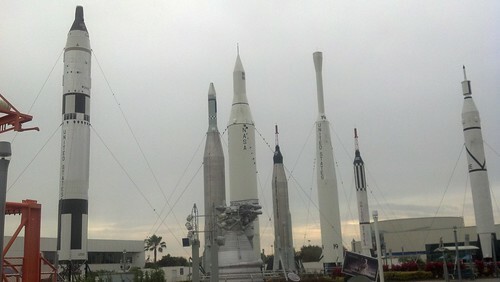 I was tiring by this point, so the only exhibit at the main visitor center that I hit up was the rocket garden. I have no idea if these are actual rockets or mock-ups. I didn’t spend a lot of time there because it started to rain and I didn’t want to ruin my camera. 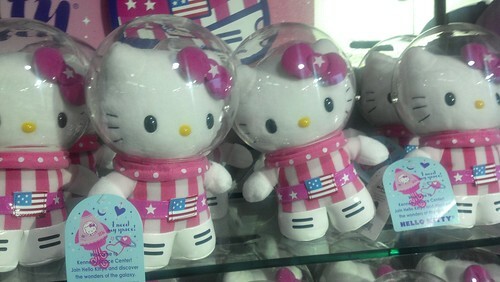 And lastly, I saw that the visitor center had one unusual item. I didn’t feel like driving very far afterward, so I only got as far as Titusville, about 15 minutes away. When I checked in, the woman at the front desk looked at my identification and noted I was from Seattle. She knew someone from Seattle. He was a DJ. He DJs goth/industrial. And it just so happens I knew who he was because DJ Turbo had added me on Google+. I may even have heard him DJ once or twice, though I wouldn’t swear to it. I don’t go out as much as I used to. I did have one goal that night though. Extract everything from my bags and repack it so as to be more useful for the next couple of weeks of travel. I needed to get the stuff I wanted to wear in my small suitcase so I don’t need to carry both in every time. And find all my electronic stuff and get it into my electronics backpack so I know where it is. Also, laundry.